What is a sustainable home we hear you ask? It’s one that attempts to minimize the depletion of natural resources in its use and construction, when compared to traditional housing. While all new dwellings use up valuable resources, sustainable homes try to be as earth-friendly as possible. That means: sustainable timber, low toxicity materials, passive solar design to minimize energy consumption, low waste water systems, reusing gray water, low water and native species gardens, energy efficient appliances and renewable water heating and electricity. 1. Hobbit house earth shelter: Making your house resistant to the vagaries of temperature change can be as easy as burying it in earth. This beautiful home was made from recovered scraps on a very small income. The house is powered using solar panels, includes a skylight in the roof to let in natural light and water is supplied from a nearby spring. 2. House powered by Spinach! Popeye would love this — a house design that has the quirky distinction of using spinach to generate electricity though a phototropic ‘skin’. Waste water feeds a vegetable garden and soy-foam walls maintain an even internal temperature. 3. Rotating Solar House that generates more than it uses The Heliotrope, located near Freiburg, Germany and designed by Rolf Disch was the first building in the world to create more energy than it uses. The structure sits on a giant pole and physically rotates to track the sun. The photovoltaic panels on the roof have a capacity of 6.6 kilowatts and computer controls make sure that the panel is always optimally adjusted towards the sun. 4. The Oval Tree House: This amazing treehouse is constructed around an oak tree and stands on eight spider-like legs. This beautiful construction is located WeberHaus’s World of Living show park in Germany. The house was designed to raise awareness about the links between living spaces and trees. 5. Earthship: Using traditional techniques like adobe and rammed earth, Earthship has created climate friendly and context appropriate buildings. They utilize discarded products like bottles and cans in construction and employ passive energy designs. 6. The Silo House: This design, made for the Solar Decathalon by Cornell University is composed of three cylindrical structures covered with corrugated steel cladding, which rusts and forms a protective seal. The material used for the construction of the house include locally sourced, and sustainably forested black locust, ash and beech hardwoods using zero off-gassing finishes throughout the entirety of the house interiors. 7. Beer bottle house: We could all be drinking ourselves into a new home with this beer bottle from Heiniken, designed in the 1960s. Unfortunately it never took off, though it was clearly an idea that was way ahead of its time. 8. Straw Bale home. A traditional material that is not only really cheap, widely available and renewable, but also has superior insulation value. This home built by a single mom in Arizona who had no building experience in an amazing example. She documented her amazing experience in the book A House of Straw. 9. Who Doesn’t want to live in a Dome? Buckminster Fuller made them trendy, now you can live in one with the added joy of passive energy design and sustainable materials. 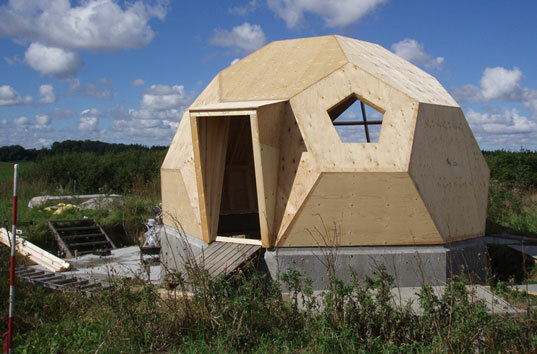 Easy Dome have made low budget prefabricated models that use sustainable wood products and thermo-energy glass. You can grow grass on the roof and solar panels are standard fittings. The shape is ideal for heavy snow or high wind conditions. 10. Prefabulous! This prefabricated home from Ideabox is the ultimate option for people seeking to purchase a sustainable dwelling. Natural lighting and passive solar design, low flow water efficiency, Energy Star appliances, low volatility paints make this a great sustainable choice, without compromise.